Today, Loremasters, let us cast our gaze towards the dangers of Jolliness. It is widely known that in the grim darkness of the 41st Millennium, there is only War. We have heard whispers that at this festive time of year, some of you are giving yourselves a reprieve from grim and stoic thoughts of enduring in a world that knows only war, and wants only your death. Emotions–aside from the stern acknowledgement that your battle-brothers, battle-sisters, and battle-non-binary-siblings are competent warriors whose stoic and grim determination uplifts your spirits as you march towards a thankless death to keep a grim and dark future all the grimmer–are dangerous. We know too well what an unrighteous wrath can bring about (not to be confused with the righteous wrath of fury in battle–please see our lecture on why the Death Company are not Khornate traitors waiting to happen), or what horrors base lust can wreak upon a world. Ambition and change are to be feared in equal measure. But there is another emotion. A much more insidious one that rears its ugly head every year at this “festive” season. That emotion, of course, is jolliness. Yes, to be jolly (even if, as ancient songs may proclaim, ’tis the season), is to invite the great pustulous eye of Nurgle to gaze upon you. For there is no one in the galaxy that embodies jolliness more than the Grandfather of Disease himself. And joy given form can wreak untold misery upon a planet–look at the incarnations of happiness and delight known as the Great Unclean Ones to see precisely why you should never ever allow yourself to feel anything other than a slight acknowledgement that a job has been done, and done well. 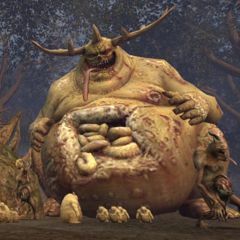 Great Unclean Ones typically take the form of gargantuan, immensely fat humanoids, hot intestines dribbling out of huge tears in their enormous bellies. Their horrific girth is supported by two impossibly small and atrophied-looking legs, their swollen heads are crowned by enormous stag-like antlers. Their suppurating, sore-covered bodies are host to every disease ever catalogued by man or daemon, and their stench can be detected from miles away. And yet, despite their completely bloated and putrid appearance, Great Unclean Ones are neither deathlike or morbid in character. In fact the opposite is true, and the daemons are motivated by all the trivial human enthusiasms which drive the living. They are gregarious and even sentimental in nature, and hold their followers dear, even referring to them as their “Children”, and taking an obvious pride in their appearance and endearing behavior. To see a Great Unclean one is to see a toothsome grin, one that knows utter happiness–there is a reason that the term rictus often accompanies grinning. It is an inhuman shape for the mouth to make. If you see anyone smiling, their brain has likely been infected with Nurgle’s Corruption, and you should report them to the Commissar for swift execution. For these walking mountains of happiness and frivolity are heralded by disease and desolation on a planetary scale. If an incursion is left unchecked, whole worlds can go dark: their populations reduced by six-sevenths, their feeble leaders filthy and raving, their very cities collapsing around them. Through it all waddles the beaming, bile-slicked plague-father, bestowing his blessings, borne along on a living tide of chortling, chattering Nurglings. Great Unclean Ones are beings of decay and entropy made manifest, and before them the works of man are but castles made of sand, perched on the edge of a storm-wracked sea. To look upon a Great Unclean One is to gaze upon the face of decay, to realize that all things must break down, must collapse and congeal, must rot and rust and fall to ruin, that the great works of man will one day vanish from the universe, and the stars themselves must one day die. That is what happiness brings to those who seek it. That is why joy is one of the greatest of Mankind’s enemies. Ward yourself from warmth. Gird yourself against giddiness. Take note of these bringers of Joy who have plagued the Imperium throughout some of its darkest ages. Gul’gulm’ga’tol is a Great Unclean One of Nurgle, who secretly invaded the Imperium Hive WorldHamagora in the aftermath of the Great Rift‘s creation. The Greater Daemon then turned the sprawling sewage works of Hive Agrippa, into its own personal baths and corrupted them into a morass of rancid gruel. Soon an endless swarm of Nurgle Daemons emerged from the filth and turned Agrippa into ruins. Once they learn of the invasion, the Scythes of the Emperor Chapter‘s Second Company came to the world’s aid, but quickly found themselves under siege; as for every Daemon they destroyed two more took its place. It was only when Gul’gulm’ga’tol was cast back into the Warp, by Strike Force Harbinger of the Grey Knights‘ Fifth Brotherhood, that the threat to Hamagora was ended. Bol’Groblort is a Great Unclean One of Nurgle. 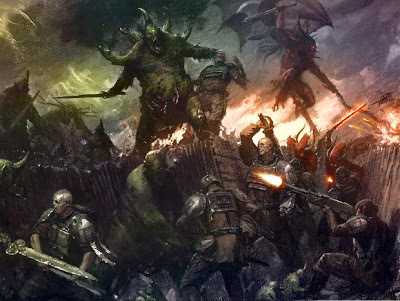 During the Warp Storms that plagued the Imperium in the closing days of M41, Bol’Groblort appeared at the heart of a Daemonic legion on Fimnir. However he was foiled by the Grey Knights 1st Brotherhood and slain by Brother-Captain Cadrig Pelenas. Ku’Gath was once a Nurgling sitting upon the shoulder of Nurgle. Whilst Nurgle was mixing his most virulent toxin ever, Ku’Gath tumbled from his nesting place into the cauldron, where he took a great draught of the filthy contents and swelled with its power. Invigorated, Ku’Gath drank and drank until the cauldron was nearly empty and he had grown into a Great Unclean One. 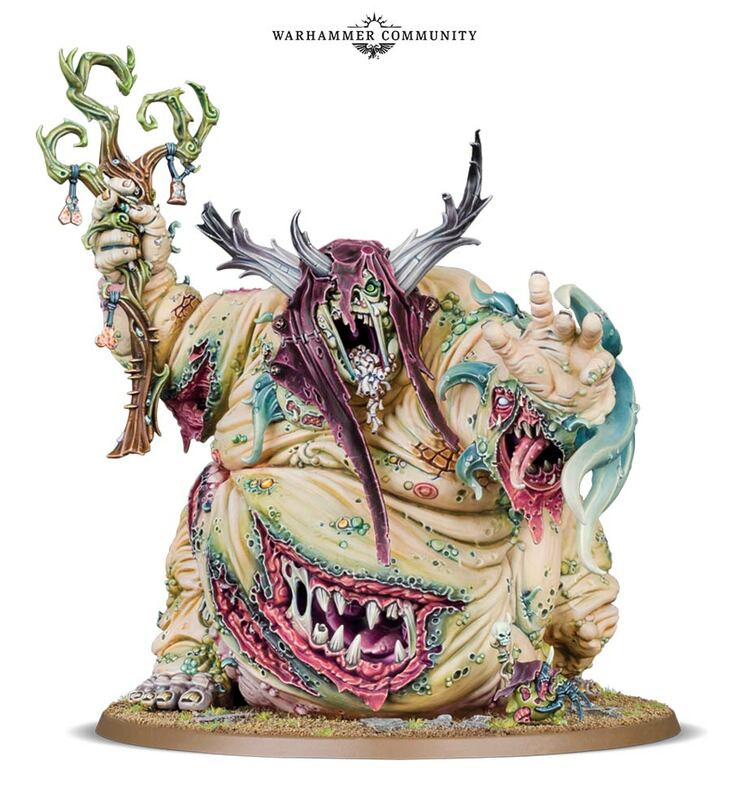 Nurgle laughed at the antics of his Nurgling, who had become the embodiment of the perfect disease that had been bubbling within the cauldron. Ku’Gath, however, realised that he had robbed his father of the greatest disease ever concocted; and has since been wandering the universe, searching for the perfect ingredients to recreate the toxin for Nurgle. He also captures those whom his diseases corrupt and take them back to his lair, where he can observe their degeneration more closely. 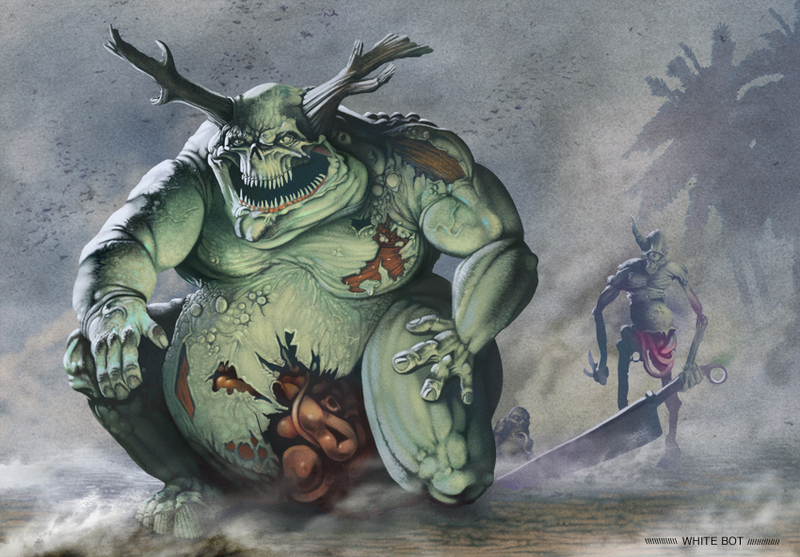 Aghalbor, known as the Bringer of Poxes, was a Great Unclean One of Nurgle. During the Horus Heresy, Aghalbor battled Vulkan and his companions in the Webway city of Calastar as they attempted to reach Terra. Thanks to the Talisman of Seven Hammers Vulkan was able to overcome the Daemon and give it a True Death. Pestus Throon is an extremely large Great Unclean One, who is known for the considerable power he wields. Among his proudest accomplishments, which he shares often, is the complete destruction of the ancient empire of the Dravians, which he did so thoroughly that no mortal history knows of its existence. He commands one of the seven legions within Nurgle‘s elite Plague Guard and aided the Guard in claiming the Ultramar world Iax, during the Plague Wars. Ulkair is first known to have engulfed the planet Aurelia into a massive Warp Storm, the aftermath of which left the planet a frozen wasteland. Later, the Daemon was confronted by Moriah of the Blood Ravens, who fell in battle against the Greater Daemon. Moriah’s apprentice, Azariah Kyras, managed to avenge his master by imprisoning the Daemon into Aurelia, where it remained trapped until the world’s invasion by the Black Legion. 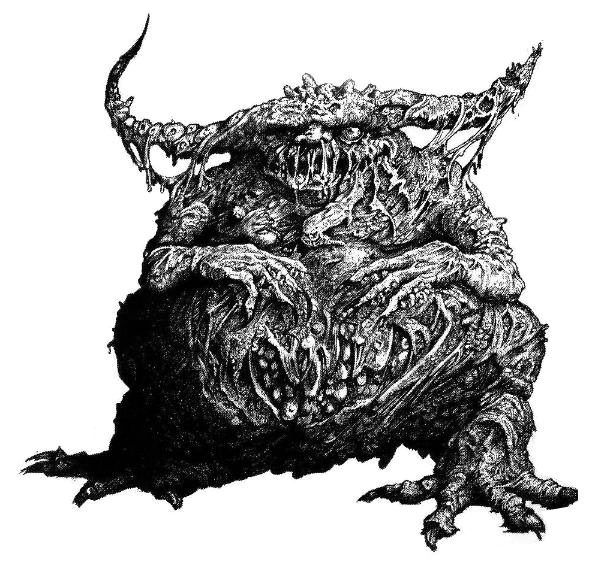 Rotigus is a powerful Great Unclean One of Nurgle, who is worshiped in the far corners of the universe as a generous, life-giving deity of prosperity and fecundity. However the gifts he gives are foul in nature, and any who pray for Rotigus’s patronage soon see the error of their ways. During the Siege of Nebbus, the Great Unclean One was summoned by the Death Guard and the filth and madness he wrought ultimately claimed the world for Nurgle. Rotigus is the latest to be seen–a new face that bears the death-inducing grin of Nurgle. Let this be a warning to you all. If you are happy and you know it–immediately report yourself to a superior officer so that you can protect yourself from further daemonic possession/influence. A happy thought is a heretical thought.